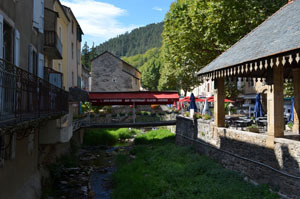 Leaving our hotel we drove down though the pretty town of Le Rozier which sits at the junction of the Tarn and Jointe rivers. Outside of town by the side of the road was a hand made sign for Miel (honey). We knocked on the farmhouse door and the beekeeper brought us into the small barn. There were many varieties and we tasted each. She takes her bee hives and moves them around the gorge. The bees collect from certain flowers in each area making distinct honey in each. 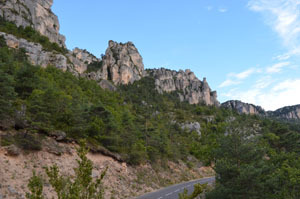 For more gorge scenery we drove east along the Gorges de la Jointe to Peyreleau which sits clinging to the gorge walls. We walked up the narrow streets and visited the old chateau. Continuing along the sometimes one lane road we enjoyed spectacular views, steep cliff walls dramatically rising from the road on one side and isolated farms and river on the other. 13 miles (21 km) later we arrived in the village of Meyrueis which sits on the banks of the Jointe river. Lovely picturesque village but after the isolated landscape it seemed too touristy although there were not many people there. (It is an easier drive to this town coming from the east.) The many restaurants and outdoor cafes along the river would make for a great lunch stop if we were in the mood. We walked around a bit and tried to get some picnic supplies at the grocery store but it was closed for lunch. However at the town bakery we bought the best petit pain au chocolat we’ve ever tasted. Flaky, buttery and light as a feather. Such happiness! 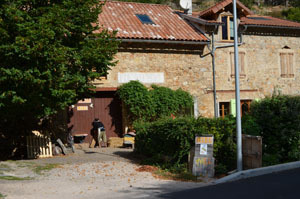 We retraced our drive back west to Le Rozier and from here an easy drive to Millau. Millau viaduct (Millau bridge) is a beautiful site and a feat of engineering. It spans 1.5 miles across the Tarn river valley. It’s tallest pillar is higher than the Eiffel tower. Our route was not across the bridge which goes north towards Paris but we got beautiful views as we drove by. Millau is also famous for fine leather goods which it still manufactures today. From Millau it was an easy drive to Carcassone. 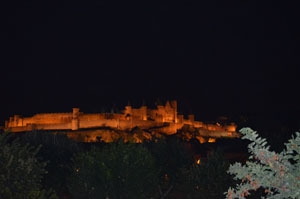 Our hotel was situated just outside the fortress walls within easy walking distance. We explored the medieval town a bit which thankfully was disgorging tourists at the end of the day. Got a dinner recommendation from our hotel for cassoulet, one of the traditional French foods of the area. Cassoulet is a stew of duck, Toulouse sausage, bacon, and white beans. The best I’ve ever eaten. It wasn’t all dried out like I’ve had elsewhere but tasted so fresh. The restaurant was packed, the service very professional. We were very hungry so appreciated the food arriving fast. Now dark outside we walked out of town to the old bridge for a spectacular view of the fortress all lit up. Join in and write your own page! It's easy to do. How? Simply click here to return to Our Travels in Southern France Bog.